You can not go wrong with apples. 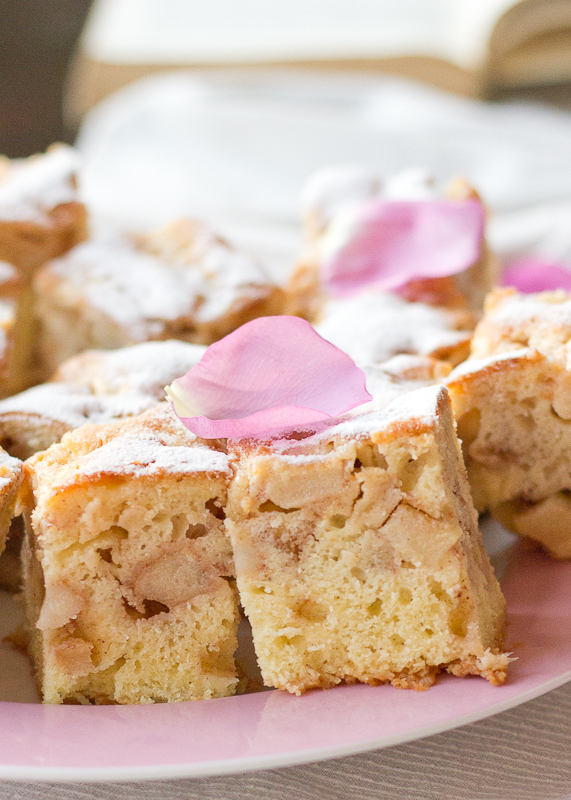 Seriously, no matter what dessert you are making, apples are a winner every time. And if you throw in some cinnamon, and some nuts, prepare for a massive treat. Classic combinations exist for a reason, and the reason is ‘cause they work. Еvery time. 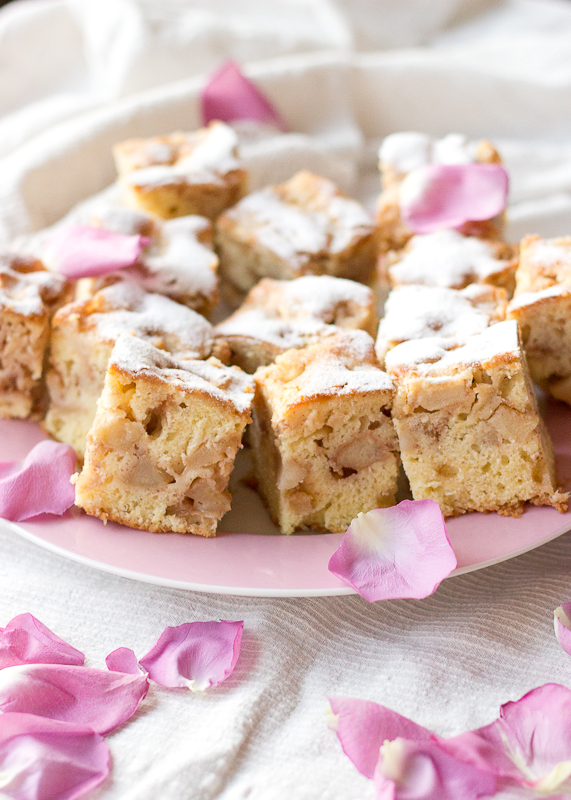 This coffee cake is easy, it’s fragrant and it’s delish. And I don’t need anything else to be happy. Just a piece of cake, a cup of coffee and a good read can provide such level of relaxation like no massage could ever reach. The most time-consuming part is pealing and coring the apples, the rest is a piece of cake (literally :)). The final batter is quite thick, and that’s ok. In the final step of the preparation you have to divide the batter in two, spreading half of it on the bottom of the pan, then distributing the apples and then finishing with the remaining batter. If the second portion of the batter does not cover fully the apples don’t worry, during baking everything will come to the right place. 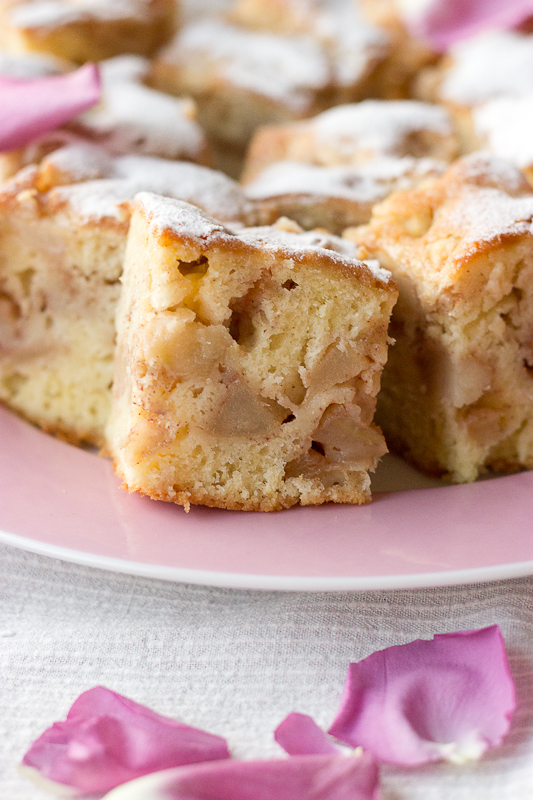 This cake is not to be eaten straight out of the oven, because the apples will be very hot and mushy and cutting it into pieces will make it fall apart. Let it cool for an hour and enjoy it as it lasts. Peel and core the apples, and cut them into small cubes. Sprinkle the brown sugar, cinnamon and lemon juice over the apple cubes, mix well and let the apples sit with the sugar for ½ hour. In a large bowl mix the flour, baking powder and salt and whisk together. In another bowl mix the oil, white sugar, the orange juice and the vanilla extract and whisk for a minute until thoroughly mixed and the sugar is dissolved. Pour the oil mixture over the flour and whisk until just incorporated. Add the eggs to the batter, one by one, whisking with a wire whisk well after each addition. Grease a 32 cm./12 inch cake pan. Pour half of the batter in the prepared pan and spread it over the bottom. Drain the apples and layer them over the batter. Pour the remaining batter on top of the apples and spread it as evenly as possible. 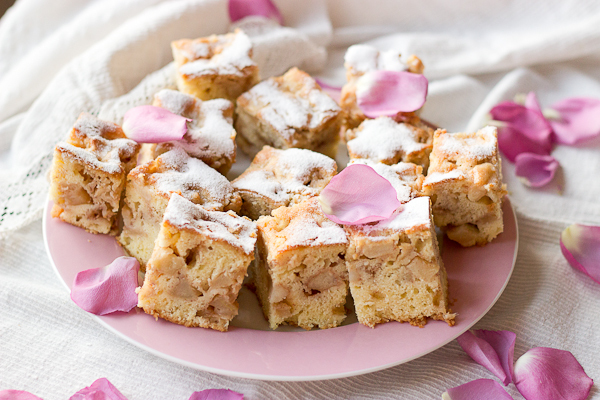 Bake for 50 minutes or until a toothpick inserted into the center of the cake comes out clean. Let the cake cool in the pan on a wire rack.